← Carbon Capture and Storage: Coal Industry Myth or Clean Energy Solution? “The future has always been an integral concern for urban planning,” Noah Raford (PhD, ‘11) notes in his dissertation. One tool that planners have long used to help communities envision the future is qualitative scenario analysis. This involves having skilled experts help participants delineate the many possible futures that a community may face, the key factors that might lead to each, and the ways of ensuring that the most desirable futures can be realized. Scenario analysis has long been a useful tool for planners, but it resides in a toolbox that is rapidly changing. As planners increasingly utilize digital technology and the connectivity provided by the online world to do their jobs, what implications will this have for more traditional methods like scenario analysis? Put more succinctly, what is the future of telling the future? Noah delves into this question by testing the first generation of “participatory online collective intelligence systems.” He creates two web-based tools that replicate the key elements of scenario planning using a digital, online format. 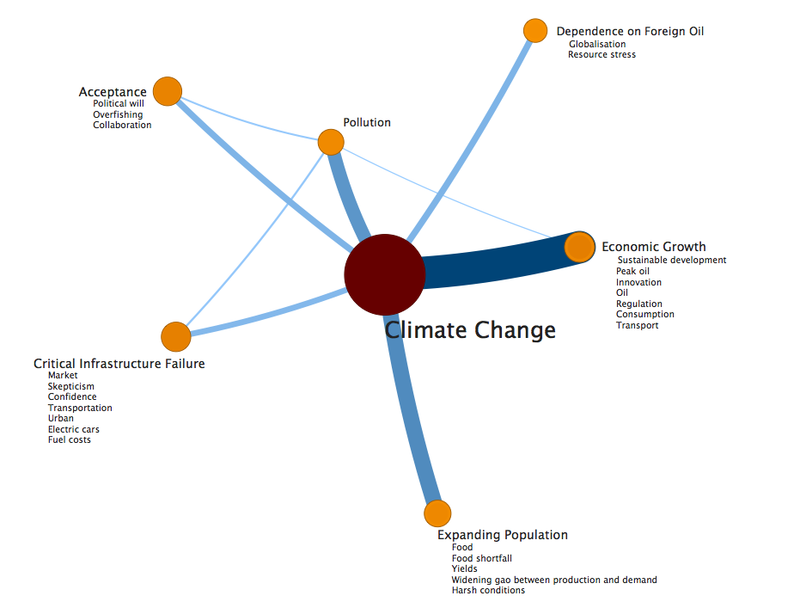 One tool helps to assess and visualize the linkages that changes in climate around the world might have on our lives. The second asks users to submit personal stories about the problems facing cities. He then shows how they can be coded using predefined variables. This allows them to be combined into cohesive scenarios. In his dissertation, Noah compares the results and effectiveness of these methods to traditional scenario analysis. He confirmed that web-based participatory methods were valuable in helping participants envision the linkages underlying scenario analysis. The planning field could build on this initial foray into web-based scenario analysis to create most robust ways of charting a shared future. Read more about it in Noah’s dissertation. Posted on January 28, 2013, in urban planning and tagged MIT, online scenario planning, urban planning. Bookmark the permalink. Leave a comment.